SINGAPORE (Nov 11, 2013): A Singaporean whose superhero-sounding name turned him into a social media celebrity was jailed for nearly three years today for theft, housebreaking and drug offences. 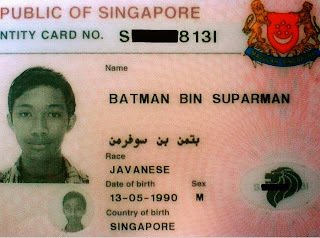 Batman bin Suparman, an unemployed 23-year-old whose name translates to "Batman son of Suparman", was arrested on Aug 19 after security videos showed him sneaking into a store at night on two separate occasions. He stole a total of S$500 (RM1280) from the store, court documents seen by AFP showed. Batman also pleaded guilty to various other charges, including stealing his brother's ATM card to make withdrawals amounting to S$650, and consuming heroin. He was sentenced to a total of 33 months in jail. Batman became a social media sensation after an image of his identity card with his unusual name was circulated online.